Two excellent full-time MSc programmes to choose from, Artificial Intelligence or Information Security. The Department of Computer Science offers two full-time master's degree programmes. Please click on the hyperlink for each course to get detailed information. 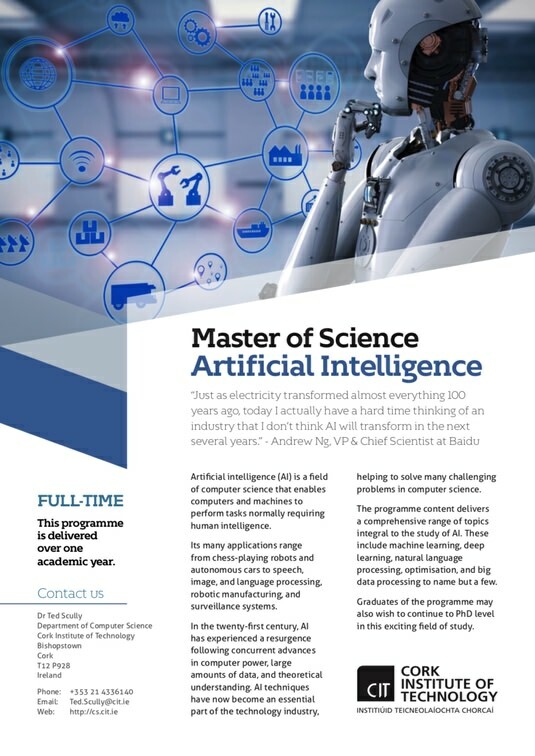 Artificial Intelligence MSc delivered on campus and fully online. Expert module in Machine Learning, Deep Learning, Big Data, Natural Language Processing(NLP), Knowledge Representation, Metaheuristic Optimisation, Decision Analytics and many more. Cyber Security MSc, Cybersecurity MSc. Full-time MSc in Information Security has a strong applied focus with in-depth theory. Developed with industry’s leading experts. Cyber Security MSc, Cybersecurity MSc, also available fully online, no need to travel. Alternatively, if you just need a quick overview of each programme please click on one of the images below to download a pdf flyer for each programme. The flyers offer a brief introduction to each programme and include full programme schedules. The schedules have hyperlinks to every module descriptor allowing you to get to all the information that you need.